The Division 2 Devil May Cry 5 Dirt Rally 2.0 & MORE! 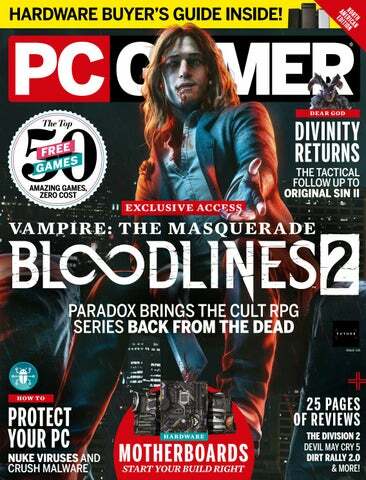 “This issue is full of the subtle things that shape PC gaming” As a long time PC gamer, I think my sense of perspective has been broken. I enjoy a Battlefield or Assassin’s Creed, but it takes the resurrection of a 15-year-old cult classic to really get me excited. PHIL SAVAGE Specialist in Vampire Twitter @Octaeder This month Managed to convince people that playing a whole bunch of free games was work. All contents © 2018 Future Publishing Limited or published under licence. All rights reserved. No part of this magazine may be used, stored, transmitted or reproduced in any way without the prior written permission of the publisher. Future Publishing Limited (company number 2008885) is registered in England and Wales. Registered office: Quay House, The Ambury, Bath BA1 1UA. All information contained in this publication is for information only and is, as far as we are aware, correct at the time of going to press. Future cannot accept any responsibility for errors or inaccuracies in such information. You are advised to contact manufacturers and retailers directly with regard to the price of products/services referred to in this publication. Apps and websites mentioned in this publication are not under our control. We are not responsible for their contents or any other changes or updates to them. This magazine is fully independent and not affiliated in any way with the companies mentioned herein. This month Prowled the dark streets of Stockholm, hunting for information about Bloodlines 2. This month Got a crash course in physics when he interviewed Turn 10 about car simulation. This month Saw the option to ride dinosaurs in Age of Wonders: Planetfall and never looked back. This month Is leaving PCG. Still made this issue as Pip as possible by writing about fish and bugs. PC Gamer (ISSN 1080-4471) is published 13 times a year, monthly plus a Holiday issue following the January issue, by Future US, Inc.,11 Hanover Square, 14th Floor New York, NY 10005 USA. Website: www. futureus.com. Periodicals postage paid in San Bruno, CA, and at additional mailing offices. Newsstand distribution is handled by Curtis Circulation Company. Basic subscription rates: one year (13 issues) US: $24; Canada: US$47; Foreign: US$47. Canadian and foreign orders must be prepaid. Canadian price includes postage and GST (GST #R128220688). PMA #40612608. Subscriptions do not include newsstand specials. POSTMASTER: Send changes of address to PC Gamer, PO Box 5852, Harlan, IA 51593-1352. 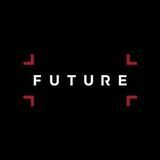 Future US, Inc. also publishes Mac|Life and Maximum PC. Entire contents copyright 2018, Future US, Inc. All rights reserved. Reproduction in whole or in part is prohibited. Future US, Inc. is not affiliated with the companies or products covered in PC Gamer. Reproduction on the Internet of the articles and pictures in this magazine is illegal without the prior written consent of PC Gamer . Products named in the pages of PC Gamer are trademarks of their respective companies. If you submit material to us, you warrant that you own the material and/or have the necessary rights/permissions to supply the material and you automatically grant Future and its licensees a licence to publish your submission in whole or in part in any/all issues and/or editions of publications, in any format published worldwide and on associated websites, social media channels and associated products. Any material you submit is sent at your own risk and, although every care is taken, neither Future nor its employees, agents, subcontractors or licensees shall be liable for loss or damage. We assume all unsolicited material is for publication unless otherwise stated, and reserve the right to edit, amend, adapt all submissions. Dwarf Fortress comes to Steam. 10	SPECIAL REPORT	The role of audience analysis. How to make a HOPA scene. 14	INSIDE	DEVELOPMENT	Why developers make merchandise. Vampire: The Masquerade is back from the dead. 44	Forza Motorsport How does Turn 10 make its cars feel so good to drive? 50	Abzu Exploring how the meditative diving game recreates the dream of scuba. 54	The Top 50 Free Games A selection of amazing games that cost nothing to play. Andy uncovers the follow-up to Divinity: Original Sin 2. Surprise! Itâ&#x20AC;&#x2122;s a tactical strategy. The cult favorite vampire RPG returns, this time with Paradox at the helm. Rick Lane investigates. Andy talks to Turn 10 Studios about creating the simulation that powers the Forza series. The Warframe joke that just won’t die. 88 MOD SPOTLIGHT	A STALKER megamod. Part three of Rick’s Dishonored 2 adventure. Why Bulletstorm is the smartest dumb game around. 104 MUST PLAY	Andy’s favourite PC games. Hardware 106 GROUP TEST	The best motherboards. 110 BUYER’S GUIDE	What’re you buying? Our annual list of the best 50 free games you can play. No microtransactions allowed. Sam explores Washington DC in search of the finest kneepads in the loot table. A crucial part of your PC build. Our hardware experts can help you find the right mobo for your rig. Comparing games can yield useful data. s we glide towards E3 season, the gaming community is braced for a glut of trailers, announcements, and other marketing gubbins. Some of these digital bids for your attention will sink with barely a retweet, but others will tear round the internet at high speed, passed from tweet to tweet, chucked onto Facebook feeds, dissected in subreddits, and more. But how do companies navigate virality and use it to their advantage? That’s where firms like Pulsar come in. Marc Geffen, Pulsar’s vice president of US strategy and research describes Pulsar as an audience intelligence company. “Ultimately, we help clients connect the dots between what their audience says on social media, how they think while conducting a search, and what they actually do on their website.” This involves pulling data from social media, search, web analytics, and AI-powered image analysis and being able to interpret it. Some of the work Pulsar does for brands is covered by non-disclosure agreements so we can’t name the company, but Geffen gives us an example of the work. Pulsar spent around nine months of research on the launch of a sequel title for a top publisher. They tracked social audience reactions at each stage, including the initial announcement, E3, console release, and PC release. The main aim was to figure out who was part of the conversation around the game, who was missing and why. A lot of it hinged around the resonance of the game’s story, and thus the age-old problem for sequels: How do you satisfy core fans and use the story to add richness and depth to a world they know while also appealing to new players who need the story to be approachable and for the concepts to be sticky? To track that type of feedback Pulsar can follow various lines of enquiry. One example involves isolating all the conversations about storyline then drilling down into the ones where clear emotions and perceptions are revealed (it’s confusing, it’s delightful, it’s underwhelming etc). From there they’d try to understand the type of persona each point of view was coming from. Once they had an accurate sense of which perceptions tied to which audience segments, they could use those to create filters and apply those filters to the whole dataset. After the game’s release the research continued, this time looking at critical feedback and issues being raised by the community. “In short, the brief was to understand how negative opinions from some core fans who were underwhelmed by the release diffused to the mainstream,” says Geffen. Virality study Pulsar has identified two models of virality. There’s the ‘spike’, where you get a sudden explosion of activity and a gradual ‘growth’ pattern. Grower audiences tend to be more fragmented and need a push to artificially spread. Spikers are more cohesive, but that means the info passes through them faster. LEFT: Knowing how the Fortnite and Black Ops 4 audiences intersect can help companies decide how to reach those players. The dominant venue houses 42% of the chat around esports—it’s mainly about the latest news. The place for 19% of the game talk and where you’ll most likely find esports memes and reactions. The 17% of the chat that’s happening on Tumblr has a focus on big-picture league performance. Forums (which includes Reddit) account for 12% of the chat and lean towards post-match analysis.